One of my all time favorite events to witness first hand is that of a baby taking it’s first steps. Gingerly pulling themselves up to the cheers of his or her parents. Then, with no hesitation, they go. Wobbling legs, awkward gate, arms flailing at their sides, they go. The typical senario of this magical site is the baby headed toward the open arms of a loved one. Coached, encouraged and loved, every single step. The one constant in this momentous occasion is that something is clearly absent….fear. Babies don’t worry about falling. Babies have no idea what “good enough” looks like. They don’t care if they look off balance and less than perfect. They haven’t learned the concept of fitting in or being “right.” Even when they do fall, typically they get right back up and do it again. I can see the smiles in my mind. Oh how that inspires me. As much as I would love to say more about babies and all their magical wonder, what I’m getting at here is fear. You know it. You have felt it. Maybe that tingling feeling of your neck getting red as it rises up to your face during a presentation. Could be the small lakes forming in your palms and armpits during a job interview. Or the feeling of your heart beating inside your head instead of your chest as you approach your first black diamond slope. Then there’s the heavy feeling in your heart that tells you you will never be good enough. For me, right now, it’s the overwhelming fear of failure over writing my first thought provoking piece since graduate school. When did we get it? Where did it come from? What messages or tapes are on auto play in our minds that tell us we aren’t good enough to do something? As we grow, the psyche is infused with varied events and memories. Some invoke joy and growth, some sting with pain and loss. Regardless which emotions are driving, the comfort, ironically lies in remaining with the emotion. Even the ones that make us cringe should become welcome guests. Shying away and neglecting maladaptive feelings only make them larger and allow them more hiding places in our day to day lives. They creep up under the guise of addiction, avoidance, isolation, and regret. Acknowledge them head on. Once the fear has a challenger (us) it begins to become managable. Once it becomes managable, it slowly either dissapates or becomes a natural part of our makeup. A qualified therapist can help immensley to foster cognitive reframing through self talk and support groups. We too have fear. We arent’ Wonder Woman or Superman. Heck, if we were, I’d be flying over the Rockies instead of sweating out this article. A key part of the maturation process is delveloping ourselves as individuals. Carl Jung refers to it as individuation. Individuation comes from the Latin word individuus, meaning “undivided.” This wonderous evolution doesn’t always present itself without pain. However once we accept the things that we normally flee from, they stop chasing us. 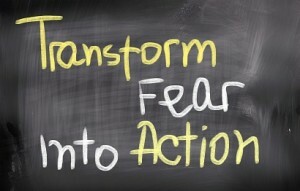 With acceptence, we integrate our fears into our lives and they become part of our whole. We are undivided. This landscape of approaching new and challenging feats varies greatly between the smiling toddler taking its first steps and the adult preparing for his first public speaking event. The difference between the fearful adult and the carefree child is clearly evident in how the child’s determination hasn’t been judged, criticized, or faced discrimination, bias and inequitable treatment. Instead, the soulful spirit of the child is fresh and new; full of hope and vigor yet still able to move forth into the unknown with excitement and confidence. If only we could store that essence in a bottle and save it for the days we are feeling inadequate, fearful, anxious and hopeless. Actually, with the thoughtful, heart centered work I do on this topic with both my clients and myself; the more I see we all have the bottle of magic juice. When we redirect our thoughts and reframe our situation, we unlock the potential for growth and change. Being with the fear, undivided, actually allowing it to be a part of us fosters a comfort in the knowing. The fear of inadequacy is no longer a threat and when that takes place…when that happens, eventually the fear will dissipate. It has lost the power that we were feeding into it. Sure, I still get a tingle up the back of my spine and down the hallow of my throat when I get up to do public speaking however it doesn’t panic me like it used to. What it finally came down to with me was I learned to love myself more than I feared what others thought of me. I developed what I call the Kendra parachute. It’s an imaginary parachute I keep in my mind at all times. When I get nervous or tense in any given situation, I strap it to my back, face my fear……and jump. I just did it again. So can you. Kendra Docker, LPC is a licensed professional counselor in Denver Colorado. She obtained her Master of Arts in Community Counseling from Regis University, also in Denver. She is the owner and lead therapist of her private practice, Soul Garden Counseling, LLC where she manages a diverse caseload. Kendra also works as an admissions counselor at Regis University where she provides personal insight on obtaining a degree in the field of counseling and/or family therapy. She helps individuals realize their dream of becoming a therapist while also navigating the world of higher education. Kendra has a grown son whom she claims made mothering so easy and joyful.